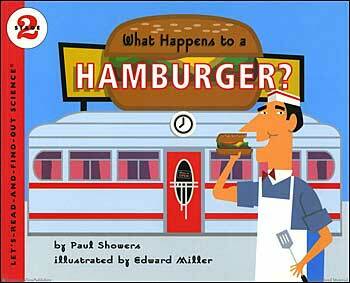 What Happens to a Hamburger? is a cute book that takes readers on a journey through the digestive system, from when food enters the mouth to what happens in the stomach and the small and large intestines. Along the way, students learn what each organ does to transform the food they eat into fuel for their bodies, and what happens to food that their body can't use. This book is part of the popular Let's Read and Find Out Science series. We love the 1950's, retro illustrations in this book, with all the action taking place in a 50's style diner (with the waiter as the narrator). Below are sample spreads from inside this book. As you can see, there is quite a bit of text, but Showers writes at just the right level to make the material understandable, and Miller's fun, retro illustrations keep the title from feeling too dense. You can see what we mean by reading the clear, conversational, and interesting text in this second sample spread. "Good food makes you strong and healthy. It gives you energy and helps you grow. / Your body uses food in different ways. It uses some kinds of food to make strong bones and hard teeth. It turns other food into solid muscles. It uses some of the food you eat to keep warm. / Before your body can do these things, it has to change the food. Solid foods like hamburgers and french fries have to be changed into liquids. Liquids like milk and juice have to be changed too. / When you change the food you eat, you are digesting it."